This week’s graph shows global annual plastics production over the past 100 years. No surprise, we see exponential growth—a hallmark of our petro-industrial consumer civilization. Long-term graphs of nearly anything (nitrogen fertilizer production, energy use, automobile production, greenhouse gas emissions, air travel, etc.) display this same exponential take-off. Plastics present a good news / bad news story. First, we should acknowledge that the production capacities we’ve developed are amazing! Worldwide, our factories now produce approximately 400 million tonnes of plastic per year. That’s more than a billion kilograms per day! Around the world we’ve built thousands of machines that can, collectively, produce plastic soft-drink and water bottles at a rate of nearly 20,000 per second. Our economic engines are so powerful that we’ve managed to double global plastic production tonnage in less than two decades. But of course that’s also the bad news: we’ve doubled plastic production tonnage in less than two decades. And the world’s corporations and governments would have us go on doubling and redoubling plastics production. 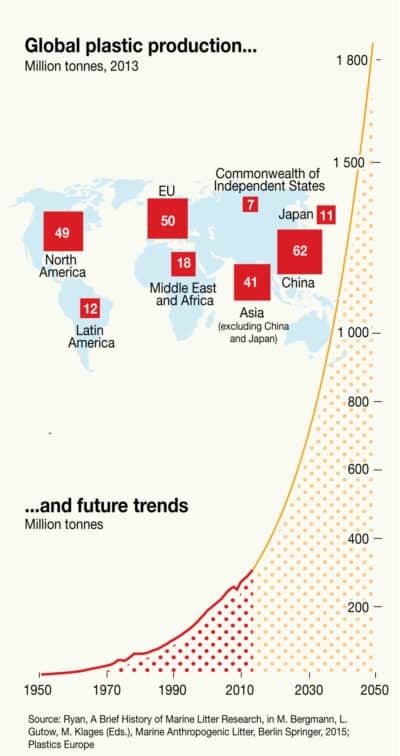 The graph below shows the projected four-fold increase in production tonnage by 2050. Plastics are a product of human ingenuity and innovation—one of civilization’s great solutions. They’re lightweight, durable, airtight, decay resistant, inexpensive, and moldable into a huge range of products. But projected 2050 levels of production are clearly too much of a good thing. Our growth-addicted economic system has a knack for turning every solution into a problem—every strength into a weakness. 1. Plastics are forever—well, almost. Except for the tonnage we’ve incinerated, nearly all the plastic ever produced still exists somewhere in the biosphere, although much of it is now invisible to humans, reduced to tiny particles in ocean and land ecosystems. Plastic is great because it lasts so long and resists decay. Plastic is a big problem for those same reasons. 2. Only 18 percent of plastic is recycled. This is the rate for plastics overall, including plastics in cars and buildings. For plastic packaging (water bottles, chip bags, supermarket packaging, etc.) the recycling rate is just 14 percent. But much of that plastic inflow is excluded during the sorting and recycling process, such that only 5 percent of plastic packaging material is actually returned to use through recycling. And one third of plastic packaging escapes garbage collection systems entirely and is lost directly into the environment: onto roadsides or into streams, lakes, and oceans. 3. Oceans are now receptacles for at least 8 billion kilograms of plastic annually—equivalent to a garbage truck full of plastic unloading into the ocean every minute. The growth rates projected above will mean that by 2050 the oceans will be receiving the equivalent of one truckload of plastic every 15 second, night and day. And unless we severely curtail plastic production and dumping, by 2050 the mass of plastic in our oceans will exceed the mass of fish. Once in the ocean, plastics persist for centuries, in the form of smaller and smaller particles. This massive contamination comes on top of other human impacts: overfishing, acidification, and ocean temperature increases. 4. Plastic is a fossil fuel product. Plastic is made from oil and natural gas feedstocks—molecules extracted from the oil and gas become the plastic. 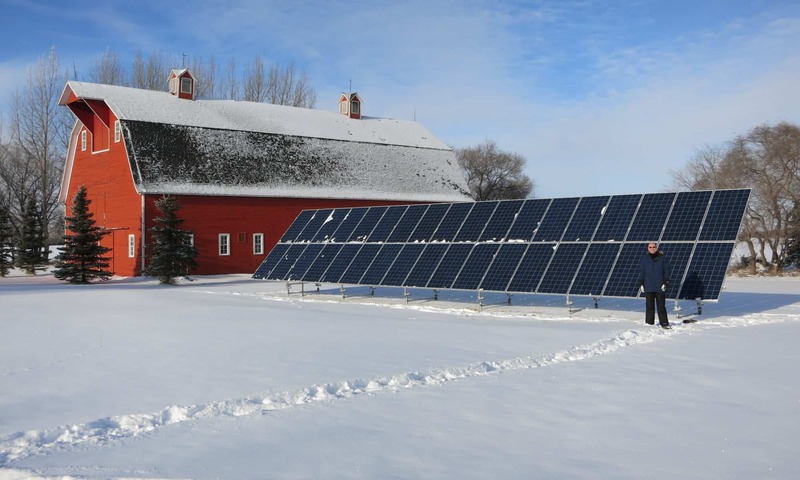 And oil, gas, and other energy sources are used to power the plastic-making processes. By one estimate, 4 percent of global oil production is consumed as raw materials for plastic and an additional 4 percent provides energy to run plastics factories. 5. Plastics contain additives than harm humans and other species: fire retardants, stabilizers, antibiotics, plasticizers, pigments, bisphenol A, phthalates, etc. Many such additives mimic hormones or disrupt hormone systems. The 150 billion kilograms of plastics currently in the oceans includes 23 billion kgs of additives, all of which will eventually be released into those ocean ecosystems. It’s important to think about plastics, not just because doing so shows us that we’re doing something wrong, but because the tragic story of plastics shows us why and how our production and energy systems go wrong. 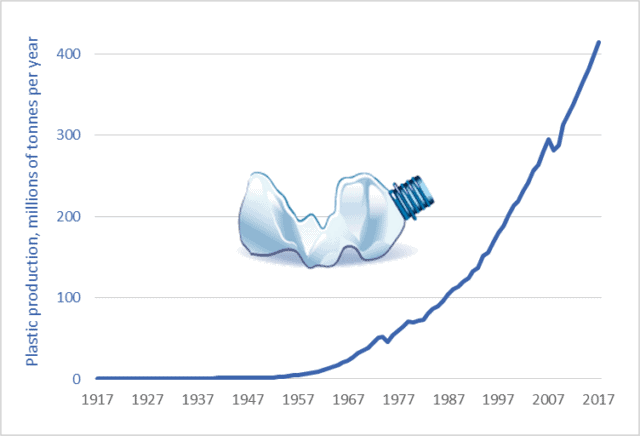 The story of plastics reveals the role of exponential growth in turning solutions into problems. Thinking about the product-flow of plastics (oil well … factory … store … home … landfill/ocean) shows us why it is so critical to adopt closed-loop recycling and highly effective product-stewardship systems. And the entire plastics debacle illustrates the hidden costs of consumerism, the collateral damage of disposable products, and the failure of “the markets” to protect the planet. • 1950 to 2015 data from Geyer, Jambeck, and Law, “Production, Use, and Fate of All Plastics Ever Made,” Science Advances 3, no. 7 (July 2017). • 2016 and 2017 data points are extrapolated at a 4.3 percent growth rate derived from the average growth rate during the previous 20 years. • Pre-1950 production tonnage is assumed to be negligible, based on various sources and the very low production rates in 1950.